Notorious. BIG movie. BAD ad. My wife and kids always enjoy Sunday afternoon movies. But they usually don’t like when I come along. “Dad” typically gets narcoleptic, dozing off mid-movie. It seems that I'm just not as "moved" as they are by tales of dogs, people with 14 kids, or animated rats. So, they weren’t all that upset when I decided to skip Hotel for Dogs and walk into the next theater, which was showing Notorius (Fox Searchlight Pictures). Big words about a big man. But also an incredible overstatement. I will never understand why some ad copywriters do that. 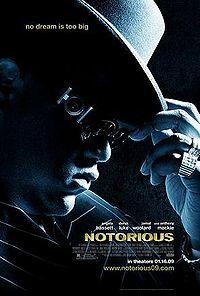 Notorious was a good movie, no question about it. But suggesting to Mr. & Mrs. America that Notorius might be another Citizen Kane, Giant, or Ben Hur was a cheap, cheap copout. "Motion picture event of our time” is huckstering that ranks right up there with “never before seen prices” and “lifetime guarantee.” Come-ons like these give ad guys a bad name. And the puffery hardly does this movie justice. Starring Jamal Woolard, Derek Luke and Antonique Smith, Notorius naturally appeals to rap fans. But I can also see the film drawing the kinds of audiences who enjoyed the Godfather or miss the Sopranos TV series. Sopranos actor John Ventimiglia, who played Artie the restaurant owner, even has a cameo as a vice cop. Interestingly, the role of the younger Wallace is played by Biggie's son, Christoper Jordan Wallace. Notorius focuses on Wallace’s meteoric rise and sudden death. But it comes at you from multiple levels. You feel sympathy for a pudgy, fatherless kid from Brooklyn. You relate to the ordinary but courageous struggle of his immigrant mother. You wince at the cruel, gritty life in "do or die Bed-Stuy." You see a new perspective on the West Coast-East Coast gang rivalry that defined the 1990s rap industry. You wonder what might have happened had B.I.G. made peace with 2Pac. Sure, the average dad might abhor the womanizing and live-for-the moment behavior. But then you start to like B.I.G. when he begins to “man up” to his responsibilities. And if there is a dominating theme to this movie it is that of a male learning to be a man. Any of these aspects of Notorius would make for a more honest, more compelling TV commercial than the ad writer gave us. I don’t think Sean Combs, Searchlight Pictures or anyone else associated with this movie thought they were making another Gone With The Wind. They just wanted to get people into the theater. And the fact that Notorius was not a lifetime event was made clear enough by the fact that the theater of more than 300 seats probably only had about 20 of those seats filled. On the other hand, my son said that Hotel For Dogs was absolutely packed. Perhaps. But I also know that Notorius kept me wide-eyed and wide awake. I would have snored through the Dogs.